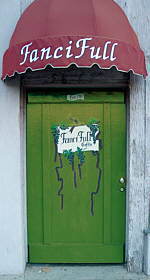 Fancifull Offers More Than Baskets - "The store is stocked full of really good stuff. In addition to beautiful and creative artisan baskets, the store features a wide array of gift items including candles, bath products, teapots, photo frames, baby items and books..."
People Magazine 2002 - "I've worked on so many high-end baskets," says FanciFull Gift Baskets CEO Terry August, who oversaw the packaging of the treats. "And I have to say, this is the best one I have ever seen. Emmy Awards 1999 - The 51st Emmy Awards was the first Emmy ceremony that awarded gift baskets. FanciFull Gift Baskets was chosen to build and design The Emmy Treasure Chest which was given to all the award presenters at The Emmys in September, 1999. Event Solutions 2007 - What better way to say "we care about you" than "we care about your health." With FanciFull Gift Baskets' new line of gift baskets, you can get the message across. MTV Movie Awards 2003 - The 2003 MTV Movie Awards Baskets were given to all the award presenters. It was designed and manufactured by Terry August and Fancifull Gift Baskets. SAG Awards 2002 - The 2002 SAG Awards Baskets were given to all the award presenters at The SAG Awards, March 10, 2002. They were designed by Terry August and Fancifull. Image Awards 2002 - The 2002 Image Awards Baskets were given to all the award presenters at The NAACP Image Awards, February 23, 2002. The basket was designed by Terry August of Fancifull Gift Baskets. Emmy Awards 2001 - The 2001 Emmy Awards Basket was designed and produced by Terry August and Fancifull Gift Baskets. The baskets were given to all the award presenters at The Emmy Awards, September 15, 2001. SAG Awards 2001 - The SAG Awards Basket was given to all the award presenters at the Screen Actors Guild Awards in March, 2001. It was designed by Terry August and produced at Fancifull Gift Baskets. Image Awards 2001 - Terry August was the designer for the 32nd Image Awards Basket. It was given to all the award presenters at the NAACP Image Awards in March, 2001. Emmy Awards 2000 - The 2000 Emmy Awards Basket was designed and produced by Terry August and Fancifull Gift Baskets. The baskets were given to all the award presenters at The Emmy Awards.